← The cycleway debate – next up, K Road. Early on Waitangi Day morning a small group of inner city residents, mainly from Grafton, Parnell and Arch Hill but even from as far afield as Ponsonby and Grey Lynn, as they had the year before, quietly gathered at the grave of Governor William Hobson to pay tribute to the man who gave us the Treaty of Waitangi and brought New Zealand into the British Empire. A wreath, posies of flowers and a New Zealand flag were respectfully placed on the marble gravestone. Waitangi Day and the Treaty has had more than its share of controversies over recent years, so much so that Captain William Hobson R.N. and his role in those momentous events of early February 1840 has been rather overlooked. What of the man himself? Interesting enough, this very dutiful servant of Empire was born in Ireland in 1792, the son of an Anglo-Irish barrister in the city of Waterford. Hobson joined the Royal Navy in 1803 during the Napoleonic Wars, just one month short of 11. Graduating to midshipman he passed his examinations and was commissioned lieutenant in 1813. Command followed in 1824. Most of Hobson’s sea service was in the West Indies intercepting pirate ships and launching raids on their bases (’nests’). In those times this duty was especially arduous not least because of the region’s often deadly tropical diseases one of which Hobson reportedly contracted. Illness was followed by a period six years ashore on half pay. However Hobson’s luck changed in 1834 when the First Lord of the Admiralty, Lord Auckland (George Eden), to Hobson’s eternal gratitude, arranged for him the highly desirable command of the frigate Rattlesnake. In her Hobson was posted to the East India Station, during which time he visited Port Jackson, New South Wales in 1837. While he was at Sydney Hobson was ordered to New Zealand to show the flag and to report on the country’s ‘lawless’ situation. His report so impressed his superiors it led to his appointment in 1839 as Consul to New Zealand. Hobson’s Treaty of Waitangi and his achievement in persuading the leading rangatira of the north to sign it (they had very little to go on except for their impression of his integrity) was a remarkable triumph. But as so often happens great success was followed not by acclaim and happiness, but rather misfortune and sorrow. On 1 March Hobson suffered what is believed to be a hemiplegic stroke. However he soon recovered. Returning to full duties he resolved to move his capital to Tāmaki on the Waitematā harbour, thereby founding the city of Auckland. This, his second great historic accomplishment drew bitter criticism from NZ Company settlers in Wellington where almost overnight from canvas tents and nikau whares colonial society had sprung up complete with declaiming newspapers and turbulent meetings of irate settlers. 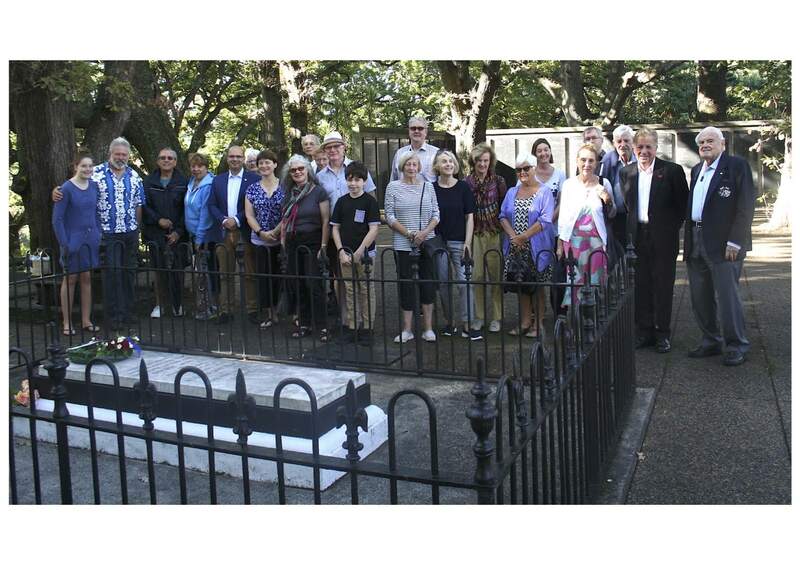 Thereafter Hobson was constantly denounced by the colonists – even in Auckland! (Lending truth to the adage ‘no good deed goes unpunished’). ‘During the months after returning to Auckland, pressures mounted, particularly at the hands of the town’s ‘Clique’ whose members hounded him mercilessly, instigating public meetings to humiliate him when his enfeebled condition was worsening. In Aug. 1842, too sick to attend public meetings, he was asked to sign petitions condemnatory of himself in attachments to memorials from citizens’ meetings’. Dr Trubuhovich concluded ‘Perhaps it was all too much for him, he simply gave up in spirit and allowed/wished himself to die.’ He was only 49. Governor Hobson, architect of the Treaty of Waitangi, founder of the modern state of New Zealand, founder of the city of Auckland, is buried in Symonds Street cemetery. It is a strange feeling to go there and stand at the grave of this ancient figure from an entirely different age to our own. There is a quietness there, even though it is only metres from the Southern Motorway on-ramp, where traffic roars by. He has lain there for 172 years, largely forgotten by the citizens of the country and the city he founded. He was the only governor to stay. A great write up thanks. Too little is made of our first Governor and his team. It is pleasing to see the group attending on Waitangi Day. I visited the gravesite some years ago and was almost physically sick – brought about by the ugly sight of drug paraphernalia festooned on the grave’s railings and other copious rubbish festering in what should be a key element of the country’s heritage and history. You also correctly touch upon the fact that Hobson and his legacy is being watered down by political correctness et al. Time to stand up to that! Your point about the embryonic government being severely under-resourced is well taken. They were heroes! Thanks very much G.S.C. Your comments are much appreciated. They were giants – we live in a time of lesser mortals.